Two legendary men who left their marks on the grand history of the Monon Bell Classic were honored Thursday night when alumni from Wabash and DePauw gathered in Indianapolis for the annual Monon Bell Stag. Wabash's Pete Metzelaars ’82 and long-time DePauw coach Nick Mourouzis received the Spirit of the Monon Bell Award. The Stag is an annual event hosted by the Indianapolis alumni associations of both schools. Wabash President Pat White and DePauw President Brian Casey were on hand to celebrate the values both schools share and to make light fun of what sets the institutions apart. After the two presidents paid tribute to the unique rivalry — and exchanged a few good-natured barbs — the Spirit of the Monon Bell Awards were presented. The awards are presented by the rival alumni association to an accomplished graduate of the other college. Presenting the award to Metzelaars on behalf of the DePauw alumni body was Dr. Phil Eskew, a decorated DePauw student-athlete and prominent Indianapolis physician. 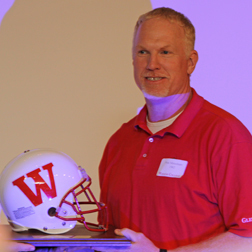 Eskew paid tribute to Metzelaars for his storied Wabash athletics career and his 16-year run as a starting tight end in the National Football League. Metzelaars was a two-time basketball All-American at Wabash, led Wabash to the 1982 Division III National Championship, and was the 1982 Division III Player of the Year. In football, Metzelaars was a Little All-American at Wabash and was drafted by the Seattle Seahawks in the third round of the 1982 NFL draft. He played 16 seasons for Seattle, Buffalo, Carolina, and Detroit, and set the NFL record for most games ever played by a tight end. He was named to the All-Rookie Team and played for four AFC Championship teams in Buffalo. He played in four Super Bowls and caught a touchdown pass in one of them. Since his retirement, Metzelaars has become a coach. He was the Offensive Quality Control Coach for the Indianapolis Colts when they won the Super Bowl, and he is now in his first year as the Colts' offensive line coach. Long-time Wabash assistant football coach Steve House presented the Spirit of the Monon Bell Award to former Tiger coach Nick Mourouzis on behalf of the Wabash alumni. 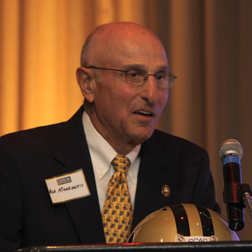 Coach Mourouzis was House's position coach at Ball State University in the 1960s, and the two rival coaches have known each other ever since. Mourouzis retired as the all-time winningest coach in DePauw football history with 138 victories during his 23 seasons as the head coach from 1981 through 2003. Mourouzis noted that his Tigers' team beat Wabash in Metzelaars' senior season, which snapped a long Wabash winning streak. After the Spirit of the Monon Bell Awards were presented, the evening turned to laughter with roasters from both schools taking stabs at one another. Approximately 250 alumni and friends of the two schools gathered for the festivities.